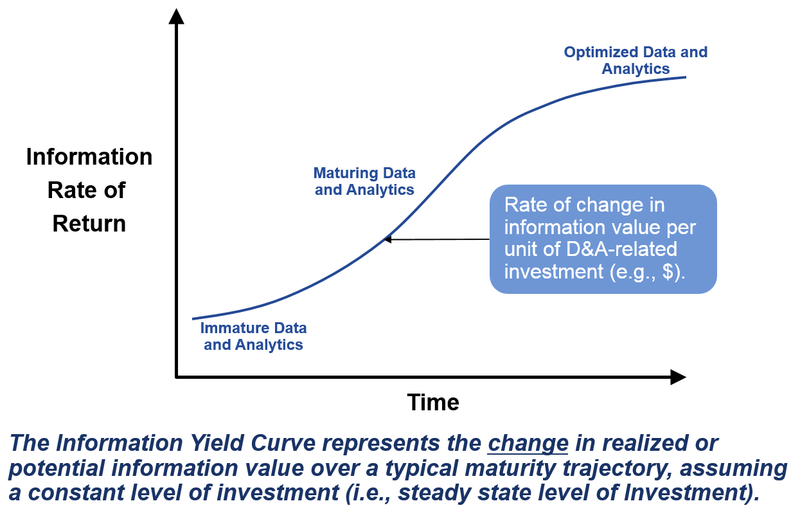 In past published research (see Increase the Return on Your Information Investments With the Information Yield Curve) I posited that every organization must have an imputed limit to its business performance, given its current level of maturity of its capabilities. This so-called information (originally IT) ‘yield curve’ implied a relationship between investment and the efficiency with which a given output or performance is achieved. A firm could invest more, or less, and in doing so increase, or reduce, outcomes, but only along the currently established yield curve. Such a change would move a firm along its yield curve, from left to right. I surmised the curve was systemically a flat ‘S’ shape on its side; see figure 1 below. Figure 1: Gartner’s Information (or productivity) Yield Curve. The yield curve itself describes a theoretical limit to the performance a firm can achieve at any moment, based on an optimal mix of information and technology, workforce skill, and management capability. An inefficient firm would actually operate in the area below the curve and, as it improves maturity of a given set of capabilities, it will move to the right. The curve describes the theoretical maximum – and so the gap between its operating position and the curve is what some describes as technical (or IT) debt. See A Primer on Technical Debt. In 2016 Gartner defined technical debt as “Technical debt is the deviation of a system from any of its nonfunctional requirements.” The yield curve work, in 2013, expresses the gap as an amalgam of deviations between actual and optimum spanning technology, worker skills, and management capability to reorganize. You could even plot all firms in a given industry on figure 1, if you accept that the information yield curve represents the limit of return for that industry, given current conditions. The yield curve effectively visually describes the limits of performance at a moment in time, and all members of an industry must operate at some point on or below the curve. Most firms will be below the curve; one or two dominant (i.e., most productive) firms will be nearer the link, and mostly likely nearer the right side of the chart. A firm operating on the curve at any point would be most efficient; effectively this would be what the OECD calls a frontier firm. It is a firm dominating its industry or even region of the world. It is unlikely that many firms would exist exactly on or that close to the curve at the same time; but it’s possible. If the market were growing so fast and resources were widely available and competition so open…. But this is not likely. Only by changing the basis the form, function or nature of one or more of these dimensions can a firm hope to change the actual relationship (the angle of the yield curve) between investment and return; actually moving and changing the shape of the yield curve. A change in any one of these three elements results in a wholly new yield curve (and possible shape) and not just for that firm but for its industry. All this is published research. So there I was at the breakfast table this morning, reading and critiquing McKinsey’s tome, “Solving the Productivity Puzzle: The Role of Demand and the Promise of Digitization“, and I reached a section looking at the impact of firm concentration and the idea that such concentration reduces competition. The section asked if it would ever be possible for any retailer to ever again compete on price and efficiency against Amazon, in a winner-takes-all; frontier-gorilla, situation? This made me think: can a firm become more productive than Amazon, given Amazon’s business platform and network effects? Yes, if a firm can innovate any or all of information, technology, skills or organizational capabilities, along wholly different lines. The former means to beat Amazon at its own game; the latter is to compete against Amazon in a wholly different way to the means Amazon itself competes. The former is about efficiency and incremental productivity; the latter is about effectiveness, disruptive innovation, and step-change productivity. So far, so obvious. The challenge here is that the economics involved would be significant in both cases. Amazon is just so productive that it may be operating on the yield curve and changing the curve itself, given the current level of information, technology, skills and management capability. So outdoing Amazon at being Amazon looks harder and harder every day. This is the conclusion in the McKinsey report. So all that is left is raw innovation. Innovation, for any or all of the dimensions of information, technology, skills and/or management capability is now required in order to reset the bounds of the established yield curve. Repeat cycle (to back to step 1). The information yield curve is altered (overall position and angle/steepness) through wave after wave of innovation (shifts the entire curve) and productivity improvement via improved maturity (points along the curve itself). I never thought of it that way but the question posed by the McKinsey report regarding “how do you beat Amazon” got me thinking. Seems logical. Now, what do I do with this thing? 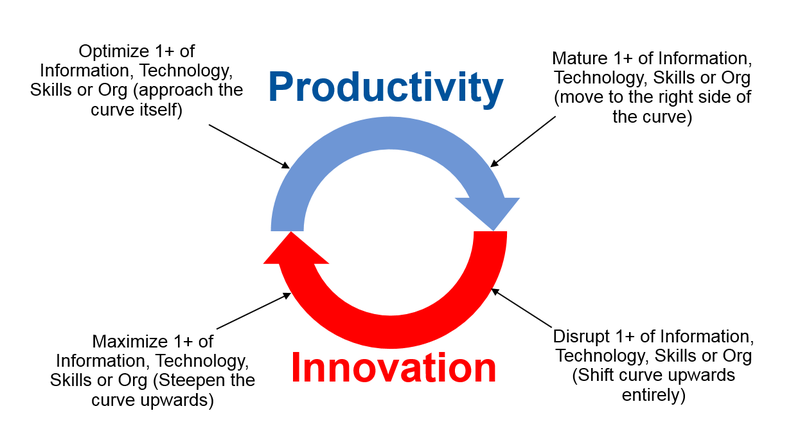 Interestingly I did a cursory search on google.com (as one does) to look for “innovation and productivity”. There seem to be a good lot of scholarly articles; but I didn’t see any that connected the two without complex algorithms or long winded text. We might be onto a good, simple way of describing how things connect….